I was born and raised in Earl Grey, Saskatchewan, a small farming community 40 minutes north of Regina, SK. Growing up in a small community and helping out on the family farm, I was raised to treat others with respect, be honest and care for others. I am proud to say these are the same values in which I run my life and my business. Family and friends are a #1 priority to me and I am a proud husband and father of three gorgeous ladies Kelley, Marley and Katey. I also enjoy playing all sorts of sports including hockey, curling, softball, volleyball and water sports. I love meeting new people and establishing new relationships. My journey in life has taken me through a ton of experiences that have prepared me for my career choice in Real Estate. I spent 8 years of my life working for an Insurance Company in customer service. The next 4 years, I worked for an Underwriting company located out of Toronto inspecting and calculating replacement costs on homes for insurance companies. I can’t begin to explain the amount of knowledge and stories that I take from those years of inspecting homes. I started my Real Estate career in 2003 and was very fortunate to be mentored by Phil Robertson, (one of Regina’s Top Real Estate Agents ). Phil has been and continues to be a major influence in my life. 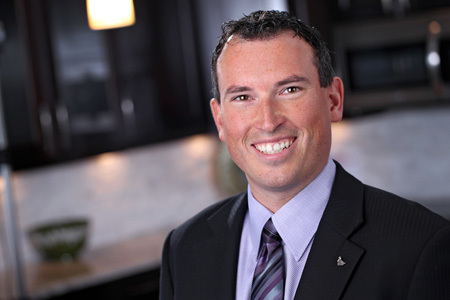 Over the past years I have dedicated myself to becoming more involved in organized real estate and am currently serving my second year on the Board of Directors for the Association of Regina Realtors. A referral is the kindest compliment! If you know any family, friends or neighbours looking to buy or sell, please pass on my name. Your referral is greatly appreciated and I will take the ultimate care and deliver exceptional service.